Legend has it that a woman likes his man like a beast. Hairy, smelly and full of muscles. But we all know the reality is very different from this legend right. We all know women like a bit of hair on the chest, yes they like some muscle but they don’t really like the smelly part. Manscaping is a modern term used to refer to the act of men removing unwanted hair from their body. Some women like a little hair on their fellas as long as they can keep it clean and neat. No one really likes a man covered in body hair that looks like fur. That is when manscaping becomes important. Some women also prefer their men to have smooth skin with no hair. It can also come down to personal choice a man. Many men are trimming or shaving body hair now. And with the popularity of this trend growing, manufacturers are developing new tools to make it easier for men to shave and trim their body hair. There are now various body hair groomers out there for men. To help you sort through the number of body hair trimmers out there, we bring you our list of the best body hair shavers for 2018. Following the Essential Back Shaver and the Professional Back Shaver, Mangroomer has come out with its highest rated electric back shaver yet, the Mangroomer Ultimate Pro. The top rating comes from newly added features such as a multi-functional head and neck that contains a shock absorber making it a breeze to maneuver the shaver over more difficult areas. Where the past two models have failed with effectively dealing with coarse, thick hair, the Ultimate Pro provides a Power Burst button for an extra surge of power that increases cutting speed. On occasion, two or more passes are required to remove thicker, coarser hair. Not only is thicker hair smoothly cut and not pulled, but this feature also reduces skin irritation. Some reviews reveal redness of the skin which lasts 20 minutes or less. The patented 135-degree opening of the Extreme Reach rubberized handle allows for lockable length utilizing the convenient lock button Pro XL Extension and angle settings utilizing the convenient lock button for the Power Hinge for the perfect reach and angle to all back areas. This new Mangroomer contains two shaving head attachments that are easily interchangeable. The first is a wide shaving head attachment that measures a full 1.8 inches and makes conquering large areas fast and easy. The other head attachment is a groomer containing a foil body that provides smooth shaves after the main body hair has been removed. 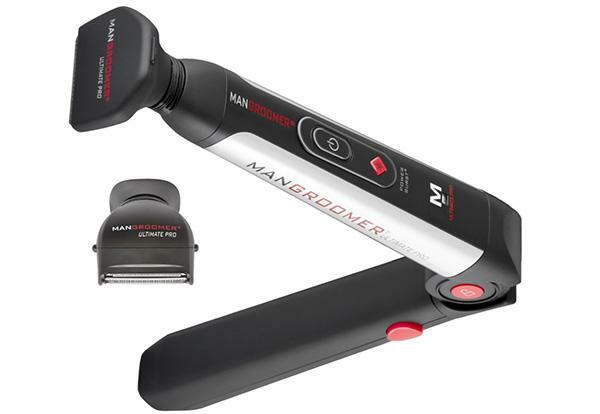 The Mangroomer Ultimate Pro is cordless and contains a rechargeable battery for fast and easy recharging after back shaving tasks. The convenient charge indicator light reveals when the Ultimate Pro is charging (indicated by a red light) and when it has reached full charge (indicated by a green light). Although a newly introduced product on the market, the Mangroomer Ultimate Pro has already received a 4.6 rating from reviewers on Amazon. Men desiring to shave away their back hair will find the Ultimate Pro a perfect purchase or welcome high ranking gift. The original design of the Bodygroom series by Philips was to shave and trim body hair below the neck. However, the high demand for a well-performing full body grooming device led to technological advancements resulting in products like the BG2030 Professional BodyGrooming System. The BG2030 contains a quality trimmer/shaver that is covered by a hypoallergenic foil which provides nick and cut protection while generating a fast, smooth shave even in more sensitive areas. The majority of users report little to no skin irritations after use. Those reported irritations either had very sensitive skin or sustained irritation due to Fordyce spots (small glandular bumps normally located around the mouth or groin area). The Norelco BG2030 comes with three attachments to accommodate numerous trimming tasks which are conveniently stored in the base of the unit. One trimmer attachment offers high-performance through 5-Lock in settings for various lengths. The second attachment is an Extra-Large trimming comb that provides fast hair reduction in large areas such as the back and chest. The third trimming comb is for use on Extra-Sensitive areas such as the underarm and the groin area. The Norelco BG2030 can be used for dry shaving, as well as wet shaving in the shower via its water resistant design. The shaver’s self-sharpening blades do not require any form of lubrication, and it performs very well on dry surfaces. However, when used in the shower, it can take numerous passes to cut hair down to skin level. The Norelco BG2030 runs on a NiCd rechargeable battery that allows the unit to be easily used in the car or office, or packed for use on vacations and work-related trips. However, the NiCd battery cannot be recharged after every use but requires almost complete draining before recharging can take place. This presents the possibility of being caught without a charge in the midst of trimming that then requires up to 11 hours of waiting before the unit is once again fully recharged. Men seeking an affordable full body hair groomer and trimmer will be well pleased with this review of the Gillette Fusion Proglide Styler. With a suggested retail price of just $20, the Fusion Proglide shaver has been rated by users to deliver decent body grooming performance at a good price. 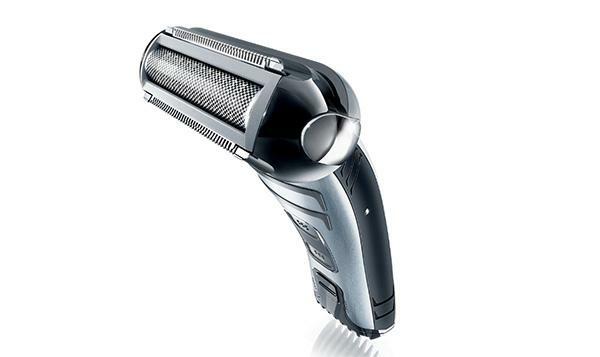 This electric trimmer is designed to shave and trim facial hair as well as hair located on other parts of the body. It is comfortable to hold and easily reaches difficult areas. As far as providing a clean shave, the Fusion Proglide removes hair on about the same level as a four-blade razor. However, it performs best at trimming, especially when done on a regular basis. If you simply want to maintain a close shave, this product may be a bit of overkill. Those men with thick, coarse or unkempt hair more consistently provide a lower ranking for this product. The Gillette Fusion Proglide Styler contains 3 combs which can be used to obtain various hair lengths. Using the electric shaver without the combs provides a close shave. The 3 combs provide a cutting range of approximately 2, 4 and 6 millimeters, although they are simply labeled comb 1, 2 and 3. A possible downside is that the blades without combs measures only 2.5 cm and with combs only 3 cm so it doesn’t provide fast trim work when you’re in a hurry. The Gillette Fusion Proglide also contains Precision Edging Blade on the reverse side which provides top micro-trimming or detailing. This shaver/trimmer utilizes a snap-on-snap-off blade cartridge which is included in the initial kit. The cartridge contains a strip that fades from green to white to let you know when it is becoming dull. When it’s time to change blades, any cartridge designed for Gillette Fusion Razors can be used. The Fusion Proglide can be used with or without shaving cream (those with coarser hair may choose to use cream). It can also be used in the shower and its comfortable rubber grip makes it easy to maneuver in wet conditions. The Fusion Proglide is not a rechargeable model and, therefore, does not require a power cord or downtime for charging. Instead, it operates on one AA battery which is included with the initial purchase.